Creating a successful corporate event takes care and consideration with preparation and planning. Your event will be tailored specifically to your needs. Accent Entertainment will be your partner to design and develop an imaginative event with impeccable service. Accent Entertainment is a full service Production Company. From the boardroom to the ballroom to the arena, we are THE source for all your production needs. The right tool for the right job. We offer the unmatched sound reinforcement of the BOSE L1 system to a concert series JBL System that will fill any size venue. We will design a package to fit your needs. Handheld wireless microphones. Lavelier Microphones. Countryman Headsets. From Boardroom Depositions to Conferences with Live Video, you will be seen and heard. Lighting: Enhance your event with atmopshere lighting. See your company logo projected on the wall in full color. Up-lighting and lighted tables will change the feel of the room. And of course, stage lighting makes sure you look good. 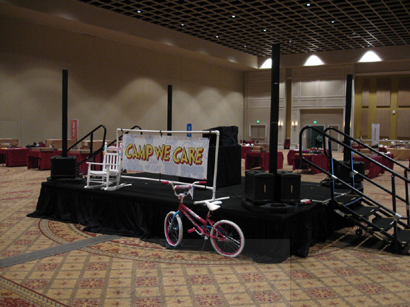 We can provide energetic entertainers for team building. Ask us about GameShow Mania and FaceOff. We look forward to working with you on your next event. Contact Us Here or call to setup a time to discuss your event.